Want To See Where Media Is Going? Follow The Money. Yet more evidence that the future of media is digital (in case there are still any doubters out there). In a report released this morning, boutique investment bank Jordan, Edmiston Group estimates that between 88 percent of the publishing and advertising industry’s revenue growth over the next few years will come from four sectors: Database & Information, B2B Online Media, Consumer Online Media, and Interactive Marketing Services. In other words, it will be coming mostly from the Web. 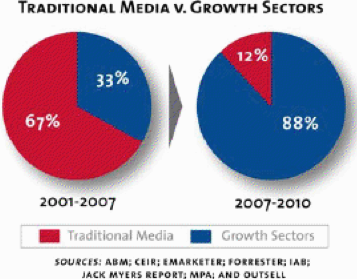 In contrast, between 2001 and 2007, only 33 percent of industry growth came from these sectors. The other 67 percent came from traditional publishing businesses such as newspapers and magazines (formerly known as print media—the report does not cover TV, radio, or outdoor advertising). To the extent that there will be any growth at all in the publishing industry, all you need to do is look at the multiples paid for different businesses to see where the growth is going to be. Last year, consumer online media companies sold on average for 4.1 times revenues and 21.3 times EBITDA. 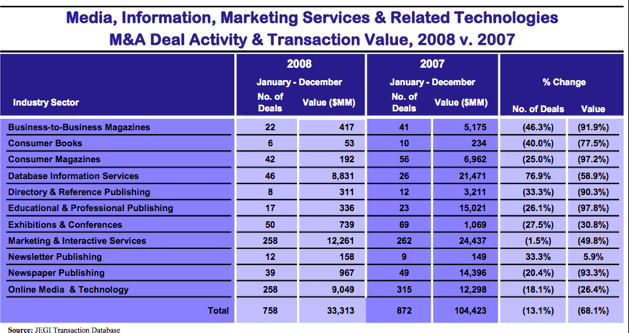 Database and information companies sold for 3.5 times revenues and 14.1 times EBITDA. Consumer magazines, on the other hand, sold for only 1.5 times revenues and 8 times EBITDA. Newspaper multiples were about the same (1.5X and 8.5X, respectively, see chart below). In a year when the value of venture-backed mergers and acquisitions were down 51 percent, M&A activity in the publishing industry was down even more. Jordan, Edmiston counts a 68 percent drop in the value of publishing media deals from $104 billion in 2007 to $33 billion in 2008. Most of these are not venture-backed startups, but many of them were tech-related. 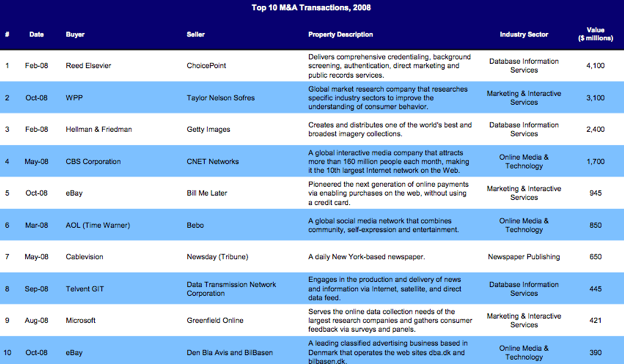 Among the top ten media M&A deals in the report are CBS’s $1.8 billion acquisition of Cnet, eBay’s $945 million purchase of Bill Me Later, and AOL’s $850 million acquisition of Bebo.